Pokemon Sun and Pokemon Moon won't just have a new region and new Pokemon - it'll also feature a new multiplayer mode: Battle Royal. 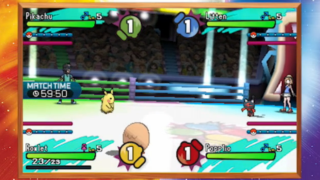 The new battle style will feature four trainers, each with their own team of three Pokemon, sending out one creature at a time. The game's producers explained that in this mode, anyone can target anyone, making it a free-for-all brawl. Once one of the four trainers has all of their Pokemon faint, it signals the end of the match. The winner is calculated based on how many Pokemon each trainer has eliminated, as well as how many Pokemon remain on their own team. Hopefully we can show you what it looks like in action soon. If you're looking for more Nintendo E3 2016 goodness, check out every announcement and full summary details on our Nintendo livestream page.